Liam Neeson...told the Telegraph in London that his character doesn't necessarily represent Christ. That might be news to Lewis, though, who wrote the opposite before he died in 1963. "The whole Narnian story is about Christ," Lewis once wrote. He said he "pictured him becoming a lion" because it's the king of beasts and because Christ is called "The Lion of Judah" in the Bible. 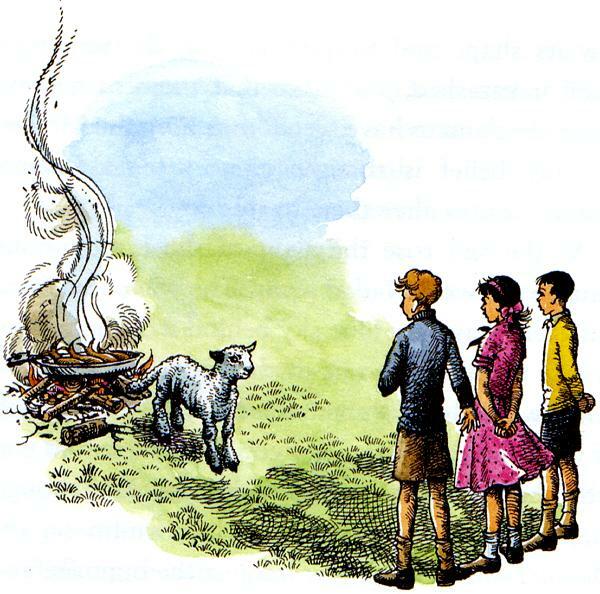 Aslan, wrote Lewis, "is an invention giving an imaginary answer to the question: 'What might Christ become like if there really were a world like Narnia?' "
But Dawn Treader producer Mark Johnson agrees with the, shall we say, more inclusive analysis from Neeson, telling The Hollywood Reporter that "resurrection exists in so many different religions in one form or another, so it's hardly exclusively Christian." The next day John seeth Jesus coming unto him, and saith, Behold the Lamb of God, which taketh away﻿﻿ the sin of the world. As soon then as they were come to land, they saw a fire of coals there, and fish laid thereon, and bread. .... Jesus saith unto them, Come and dine. And none of the disciples durst ask him, Who art thou? knowing that it was the Lord. Jesus then cometh, and taketh bread, and giveth them, and fish likewise. This is now the third time that Jesus shewed himself to his disciples, after that he was risen from the dead.